The artwork developed from the artist’s travels to Nagasaki, her husband’s family home. 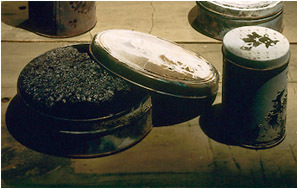 While visiting the Atomic Bomb Museum in Nagasaki, the artist saw the charred remains of artifacts, including children’s tin lunchboxes with ashes of rice. Her experiences triggered memories of the artist’s family’s experiences during the Holocaust. Burned biscuit tins filled with ashes of rice are placed on a weathered wood table. A video projected on a film screen hangs above the table, providing light and sound of hypnotic images of rain, morphing into tears and sperm-shape droplets, washing against the window. As the rain subsides a second moving landscape of sprouting rice fields appears, providing a life-affirming antidote to the remains of ashes in the tins, fusing terror and redemption. The installation is part of the artist’s ongoing reflections on trans-generational memory. 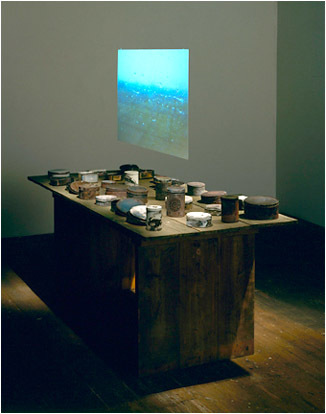 Burned rice, biscuit tins, wood table, video installation on floating film screen. Room size: 16’ x 16’ overall.